Parrot, like many tech vendors, decided to put on a show for CES attendees. And its was in the form of an orchestrated air show, with eight AR Drone 2.0s all moving in unison to music. The latest AR Drone is hardly new. The 2.0 model was introduced last year - in May 2012 to be exact. 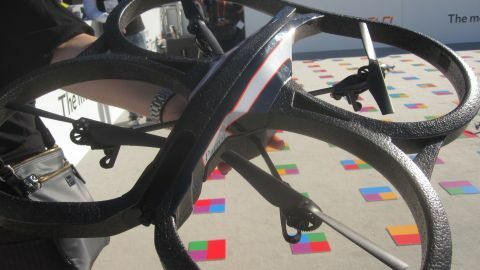 But Parrot - maker of the radio controlled flying quadrotor helicopter - did reveal that it's been working on a few things. The Parrot representative told TechRadar multiple times that they're not products, but simply "projects". First is forthcoming GPS integration, via the AR Drone 2.0 Black Box. It allows one to geolocate one's AR Drone via the GPS device. Not only does it keep track of its position, but all that information can be used to create 3D models of every movement, via the AR Drone Academy (part of the AR Drone iOS app), which previously only detailed flight information in 2D. AR Drone 2.0 Black Box can also store videos directly. With its 4GB of built-in flash memory, it can hold more than hours of HD video. Next is a 1500mAh high-density battery. Currently, the AR Drone 2.0 is only capable of five to 10 minutes of flight, even after a full charge. But the new battery will provide 50 per cent additional power, around 18-20 minutes, according to the Parrot representative. It's unknown if it will replace the one that currently ships with all AR Drone 2.0s or become a stand-alone product for existing owners. And Parrot's final project is Director Mode, which is a set of pre-canned instructions that can handle particularly tricky shots. Everything from pans, crane shots, slow downs, and more, which can all be difficult to execute manually, are now all possible with just a button press. It's even conceivable that these shots can be linked, one after another, for a particularly impressive action sequence, and in real time. It also includes a stabilization system and post-processing tricks to get super clean and smooth shots. When asked, the Parrot rep was not able to indicate if Director Mode would be a stand-alone app, or if it would be built into the aforementioned iOS app. Furthermore, Parrot may also charge for this additional functionality (the current app is free). Again, Parrot is simply in the testing phase for everything mentioned above.